Director – Anders Rønnow-Klarlund, Screenplay – Anders Rønnow-Klarlund & Naja Marie Aidt, Producer – Niels Bald, Photography – Kim Hattensen & Jan Weineke, Music – Jørgen Lauritsen, Visual Effects Supervisor – Daniel Silveweldt, Digital Visual Effects – Radar Films, Special Effects – Lars-Ole Kofoed-Hansen & Hans Peter Ludvigsen, Production Design – Sven Wichmann, Master Puppeteer – Bernd Ogrodnik, Master Puppet Builder – Joakim Zacho Weylandt. Production Company – Bald Film/Zentropa Entertainments/Nordisk Film Productions/Bob Film Sweden AB/Mainstream APS/Radar Films APS/Dr Invista Capital Ltd/Birdpic Ltd. The aging Kahro of the city of Hebalon takes his own life by severing his head string so that his son Hal Tara can inherit the throne. However, The Kahro’s scheming adviser Nezo comes by and discovers the body. Nezo destroys the suicide letter and cuts the Kahro’s other strings, leaving evidence to make it appear as though it was a murder conducted by the city’s rivals The Zeriths. Just as Nezo planned, Hal determines to find the Zeriths and obtain vengeance. Hal leaves the city in disguise with his body painted like a commoner. Nezo sends the warrior Erito to accompany Hal and kill him. Instead, Hal ends up in the enemy camp where he is drawn to the Zerith warrior woman Zita, who is unaware of his true identity. As Nezo consolidates his plans to usurp rule back in Hebalon, Erito’s wife Eike and Hal’s sister Jhinna discover his real intentions, but are captured. 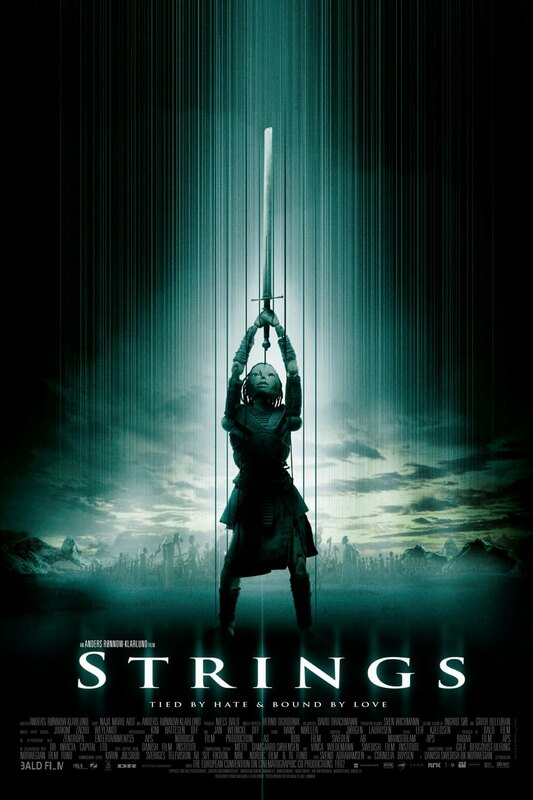 Strings is one of the most unique and original films to have come out in some time. Indeed, the local publicity director for the film confessed to me that, though Strings had received brilliant reviews, it was so unique a film they had difficulty being able to sell it as it fell into no easy categories – though it is a puppet film, it is certainly not a children’s film; and though it is an arthouse film, it is difficult to sell the idea of a concept-bending puppet film for adults. There have been puppet films and tv series before – everything from Gerry Anderson – Stingray (1963-4), Thunderbirds (1964-6), Captain Scarlet and the Mysterons (1967) et al – and the Muppets to the more recent likes of Team America: World Police (2004). On a purely technical level, the puppetry in Strings is no more advanced than any of these films – indeed, the puppets in Team America, which came out the same year, are far more fluid and expressive than the ones here. The uniqueness about Strings is that the puppetry, rather than being a few annoying strings that occasionally unintentionally show up on screen, is diegetically wound into the film. The plot of Strings is little more than a standard fantasy quest – king usurped by an evil vizier, the prince heir who sets forth into the wilderness to find his destiny where he eventually finds love and an army to fight back. However, around this, director/co-writer Anders Rønnow-Klarlund constructs a fundamental reality where the puppets exist as beings that are made of wood and move on strings. This allows for imagery and a worldview that is breathtaking in its originality. In the opening moments, we see the aging king commit suicide by cutting the string that holds his head up. In the next few moments, Anders Rønnow-Klarlund’s camera pulls back to show a remarkable wide-angle of the exterior of the city where the strings of each person stretch up into the clouds and the camera then follows the forest of strings as they disappear up into the heavens. 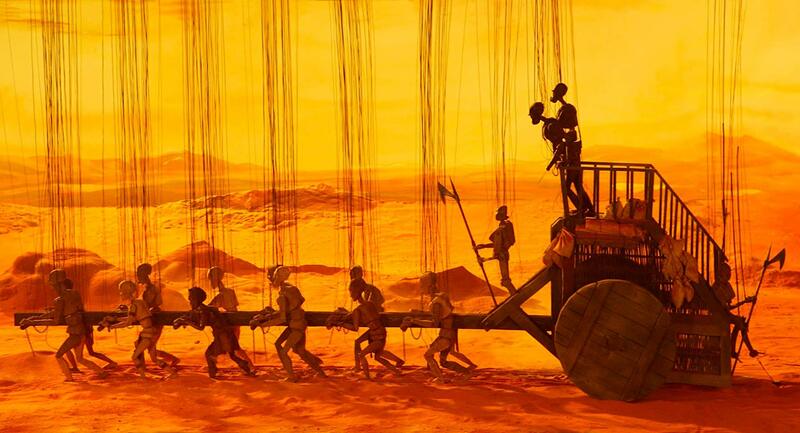 Elsewhere, we see a team of slaves labouring over a wheeled wagon in the desert under the sweltering heat of the sun while their lifestrings stretch up in a tiny nested cluster above the wagon; a Hebalon prison that consists merely of an open room with a lattice above that imprisons each puppet within its square, leaving their strings unable to stretch beyond each prisoner’s assigned space; or the climactic battle between the opposing forces with the lifestrings of combatants being set alight and their wooden bodies charred to crisp. Anders Rønnow-Klarlund manages to create some extraordinary moments of beauty and tenderness in the film, especially the scene where a baby is newly born and a glowing tendril floats down from Heaven and is attached to the child’s head, bringing it to life. The scene where a slave is tied down and his hand unscrewed to be taken and attached as replacement for the prince’s hand that has been severed during sword training comes with an amazing degree of pain and suffering. Though the puppets lack any mobility of features, the marionetteers skill is so extraordinary that the characters succeed in conveying an amazing range of tenderness and expression with infinitely subtle nuance. 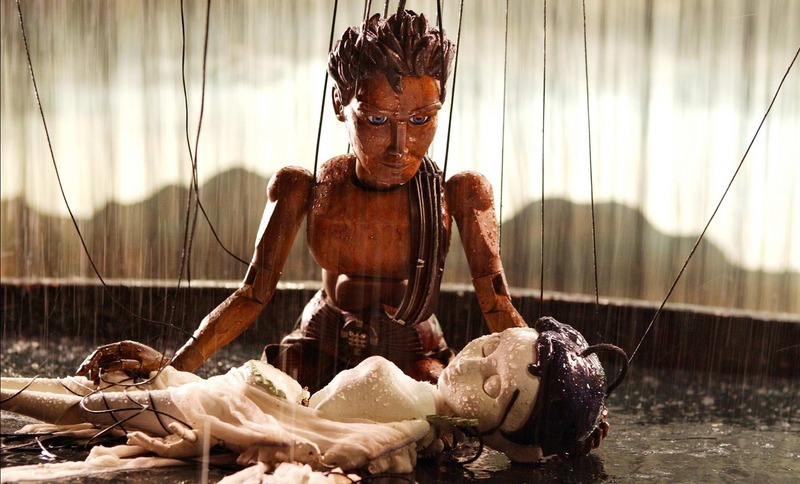 The puppeteers’ skill and the breathtaking originality of Anders Rønnow-Klarlund’s metaphor make Strings one of the most unique and original films that one has seen in some time. Danish-born director Anders Rønnow-Klarlund first appeared with the multi-stranded drama The Eighteens (1996) and then made the horror film Possessed (1999), which was produced, like Strings is, by Lars von Trier’s Zentropa Entertainments. While Possessed was a passable but not hugely distinctive a film, Strings marks Anders Rønnow-Klarlund as a major new talent worth watching in future. Rønnow-Klarlund subsequently went onto make the satirical How to Get Rid of Others (2007) about a future Denmark where those who do not meet the criteria of socially worthy are eliminated. (Winner in this site’s Top 10 Films of 2004 list).